We often hear from fellow growers that carrots can be difficult to grow. However, we think everyone would agree, they’re worth it. At Farmer’s Markets and local produce stores, consumers expect to see carrots as a staple item among crop offerings. In this blog, we will cover some basic information about carrots, such as 1) why grow them, 2) how to provide a diverse selection to your customers, and lastly, 3) how to market them. You may be wondering, if carrots can be problematic to grow, what is it that makes them worth the extra care they require? Carrots are a household favorite for most families and are one of the most common vegetables found at Farmer’s Markets. 1. By growing them locally, you’re able to offer your customers carrots that are diverse in flavor and color; attributes not typically found in carrots at large grocery stores. 2. Bright orange roots are a great contrast in color for your market offering, especially when placed next to fresh green products such as lettuce, spinach, or kale. Carrot colors can range from white to yellow, red to purple, and of course orange. 3. When grown correctly, a farmer’s market carrot will taste much better than a store-bought carrot. At Johnny’s we trial many new varieties each year and flavor is one of the most important criteria we evaluate. Each year there are many varieties that are rejected due to poor flavor. What we have selected for our carrot line are the best performing, and best tasting varieties available. 4. Depending on your locale, small-scale farmers can entice customers with carrots ranging from mini Nantes to small, round Parisian Market types. Baby vegetables are in high demand right now. 5. Carrots display extremely well at farm stands. There is something about a bunch of smooth orange roots, and fresh green tops that looks very tempting to customers. 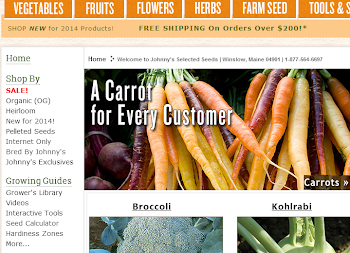 At Johnny’s, we offer a number of different types of carrots, from Nantes to Imperators. Let’s discuss the advantages and disadvantages to each type of carrot. We’ll also cover the key defining characteristics of each type. 1. Nantes: these carrots have cigar-shaped roots with blunt tips. Some varieties are more pointed and not as blunt-tipped as others. There are varieties galore within the Nante group, ranging in length and width. Some Nantes have slender, pencil-thick roots, while others have mini roots (3-4”) or large roots (7-8”), and all sizes in between. Nantes is very popular in Europe, as well as around the world. 2. Chantenay: these carrots have wedge-shaped, tapered roots and are broad shouldered. They also typically have pointed to slightly-rounded tips. Chantenay types tend to have very strong tops and can typically perform well in heavy soils due to their shape. They’re popular in Europe, Asia, and South America. 3. 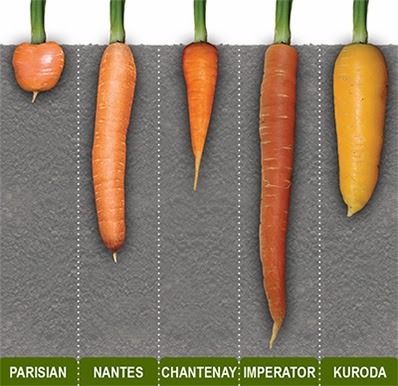 Kuroda: Kuroda carrots are similar in shape to the Chantenays; however, they typically have more bulk or weight, and are more rounded at the tip of the root. These are commonly grown in Asia. 4. Imperator: Imperator carrots have long slender roots that often reach lengths of 10” or more. These perform best in deep, light soils so that the roots can grow straight and long without small obstructions distorting the shape. Imperators are very popular in the U.S. in the industrial segment. This is also the type of carrot commonly sold as a “baby” carrot by slicing and shaving down to a baby size. There are many opportunities to market your carrot offerings to set yourself apart from other growers. One way to do this is to offer your customers a selection of baby carrots, as these crops are in high demand right now. Another marketing approach is to expand your offering of colored carrots. True baby carrots differ from carrots that are harvested prematurely since true baby types are harvested at full maturity. They also differ from the store bought “baby” carrots, which are actually full-sized carrots that have been sliced into smaller lengths and then shaved to achieve the desired size and shape. · Because they’re grown to full maturity, their flavor will be fully developed. · They can be sold as bunches or with partial tops which helps prevent the roots from drying out. Also, if you market baby carrots with their tops attached, consumers can easily distinguish them from the packaged “baby” carrots. 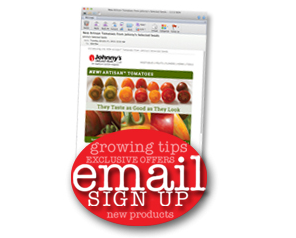 · Baby carrots have a range of market audiences. They appeal to children who eat them as value-added snacks, parents who purchase bunches for nutritious meals at home, and chefs for a variety of restaurant entrees. · Atlas: a Parisian Market type; Atlas is a small, golf-ball sized carrot with round roots. Atlas must have adequate soil moisture to maintain its round shape. Dry soil will force the roots to elongate deeper into the soil in search of water. · Caracas: a baby Chantenay, with approximately 4-4 ½” wedge-shaped roots. This carrot has strong, healthy tops. When considering ways to set your carrot display apart from your competitors, consider thinking outside of the orange carrot box. Incorporating colored carrots is a great way to add more color to your display. Colored carrots are edible raw (though more palatable when cooked), and with new healthy trends leaning towards not-your-typical vegetable colors, they’re becoming more and more popular. 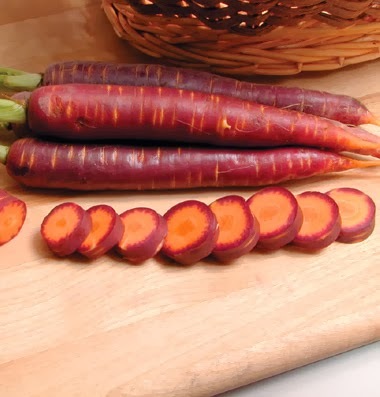 Offering purple, white, yellow, and red carrots is a great way to draw people into your Farmer’s Market stand. Also, chefs are always looking for new ways to interest their customers and colored carrots might be just what they are looking for. Leave a comment under this Blog and let us know what carrots you offer your customers, and which variety is your favorite! Eliiot Coleman spaces his carrots 2.25' in each direction. You suggest 12" - 18" between the rows, which is what I have traditionally done. Why such a discrepancy? Really interested in knowing this info. Hi, it depends on the tools you use as well as the density in which you want your crop to be. Eliot plants in intense beds which is why they are closer together. Every farmer chooses different methods based on what they want for a yield. I hope this helps. J Had great success this year in Mesa AZ growing carrots 2 inch apart in all directions in areas one foot wide by five foot long. Grew four blocks of carrots with a six inch gap between blocks. Grew onions in the gaps to prevent carrot fly. It all worked wonderfully, except the carrots swamped the onions. So I will make the gaps one foot wide next year.